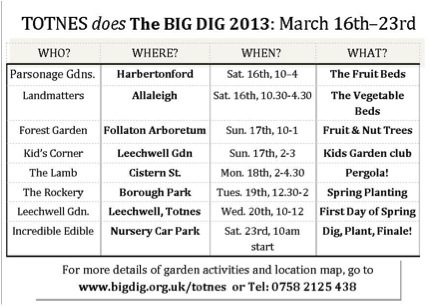 taking part in 'The Big Dig' Totnes. 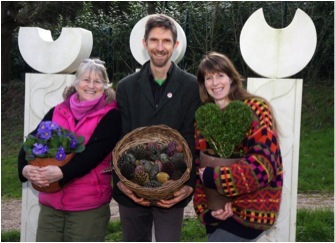 The Lamb and Leechwell Gardens are joining forces with neighbouring community gardens for a special week long national volunteer's event 'The Big Dig', which is funded by the Social Action Fund and co-ordinated by Sustain. It aims to get the local community out and about, gardening for fun, with the opportunity to pick up some new skills - and meet new people along the way! From 16th - 23rd March, you can enjoy 8 days of: Tree planting to seed sowing; raised beds to rockeries; vegetables and soft fruit to the charms of the mystic Pergola - and even helping reclaim an unloved area of town for the community. Here is a quick look at the table of events on offer - just in time for Spring!